Questions About Travelling in Sunset Country? We can help! Below is a list of frequently asked questions. 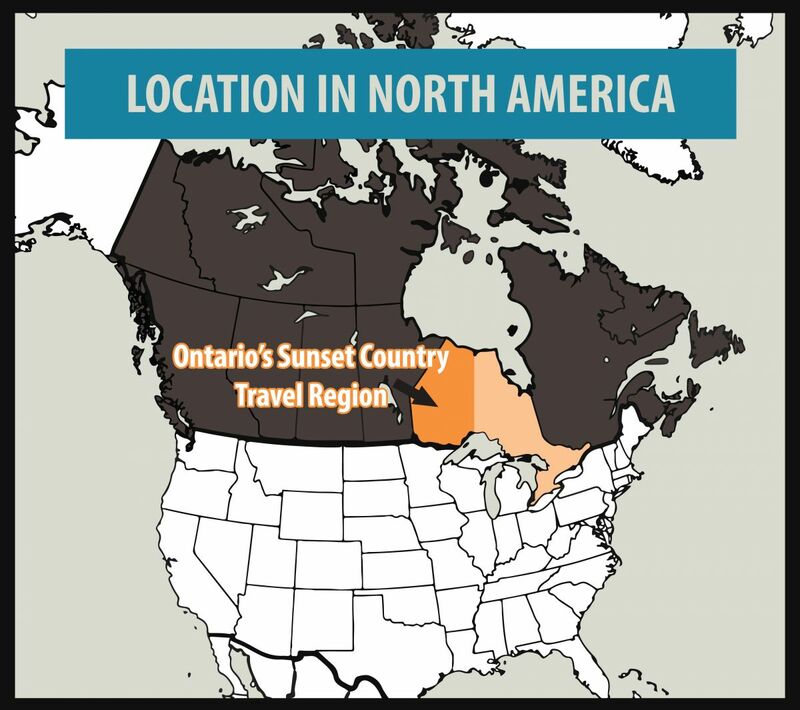 If you have further questions about traveling in Sunset Country, please contact us at the Ontario's Sunset Country Travel Association. We can be reached toll-free at 1-800-665-7567 or locally at 807-468-5853 or you can email your questions. Each community has their own FAQ page in case you need more detailed information such as directions or exact weather conditions. Sunset Country is located in the Northwest corner of Ontario, Canada. We are bordered to the south by Minnesota and to the west by Manitoba. Our eastern border is just west of Thunder Bay. How do I get to Sunset Country? Sunset Country is less than a day's drive from many US Midwest cities. For those traveling in their own RV or automobile from the United States, the major border access points from the U.S. are at International Falls, MN via US Highways 53 or 71, at Baudette, MN via Minnesota State Highway 11, and at Pigeon River via Minnesota State Highway 61. All main highways and roads in Sunset Country are paved. If you are flying, you can fly into Thunder Bay, ON, International Falls, MN or Winnipeg, MB. From there you can rent a car or van or use Kasper Transportation or fly Bearskin Airlines to various communities within Sunset Country. Charter and personal flights can land at many of the communities in Northwestern Ontario. Visit the CANPASS website for information on Canadian customs and immigration. Your tourist outfitter should be able to give you suggestions on the easiest way to their camp from your home city. You could also contact local travel agencies and have them book your flight and travel arrangements. What are the speed limits in Ontario? Speed limits are posted in kilometers. Speed limits on the main highways in the area usually 90 km/hour or 55 mph. Please follow the posted speed limits and watch for wildlife. Where can I get maps of the area? You can order a Free Travel Guide & Map of Sunset Country, which has a large pull-out map that shows all of Northwest Ontario (Accommodations & Lodging are dotted on the area map). 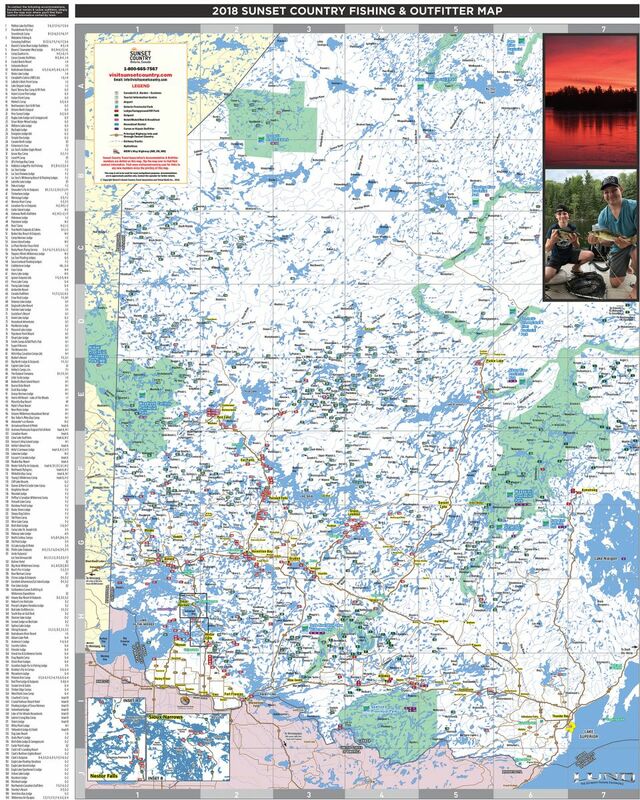 You can purchase maps of the area at www.canadamapsales.com. Hydrographic charts, angling maps, and topographical maps are available. You can also phone Canada Map Sales 1-877-627-7226 to find out which maps are available for the lakes you will be visiting. What do I need to cross the US/Canada border? The United States Government requires all of its citizens 16 years or older to have either a passport book or passport card. For more information on the difference between the passport book and passport card, visit the US Passport Card website. U.S. citizen children under age 16 arriving by land may present an original or certified copy of his or her birth certificate, Consular Report of Birth Abroad, or Certificate of Citizenship. For up-to-date information, visit the USBorder.com website. Youths under 18 traveling alone or with someone other than their parents, should also have a letter from a parent or legal guardian giving them permission to travel to Canada. U.S. citizens and citizens of Canada, Mexico and Bermuda traveling by air between the U.S. and Canada, Mexico, Central and South America, the Caribbean, and Bermuda are required to present a valid passport to enter (or re-enter) the U.S. regardless of age. For U.S. visitors, all pets must be accompanied by their owners when entering Canada. Owners of cats and dogs must bring a certificate issued by a licensed American or Canadian veterinarian clearly identifying the pet and certifying that it has been vaccinated against rabies sometime during the previous 36 months. For more information, the Canadian Food Inspection Agency offers basic guidelines for bringing your pet into Canada. Dog food is not allowed into Canada. gifts not exceeding $60 Cdn for a friend/relative in Canada duty free. This does not include tobacco products, alcoholic beverages or advertising material. Gifts more than $60 Cdn are subject to duty. * You must be at least 19 years of age to import these goods into Ontario. Any additional alcoholic beverages or tobacco products other than those listed above are subject to duty. For more information, call the Customs Border Services Agency (CSBA) at 1-800-461-9999 (within Canada) or 807-274-3655 or 204-983-3500 or visit the CSBA online. What type of bait can I bring into Ontario? It is illegal to bring live fish, crayfish or salamanders into Ontario for use as bait. It is also illegal to bring live leeches into Ontario for use as bait, unless you are the holder of a commercial bait license. Earthworms can be brought into Ontario from the United States for use as bait provided that they are in clean bedding (not soil). For more information on what types of bait you can bring into Ontario, you can download a copy of the Ontario Fishing Regulations from the Ministry of Natural Resources. What can't I bring into Canada? You can't bring the bait listed above into Ontario. You cannot bring most firearms/weapons into Canada (except for hunting). Go to the Canada Border Service Agency for further information on bringing a firearm into Canada or call 1-800-731-4000. You cannot bring stun guns, mace or any other spray to be used against humans. Are there lineups at the border crossings? During the summer months, there may be some line-ups at the border. Saturdays are usually the busiest. You can check online to see if the border where you are crossing has border wait times. They are updated hourly. What is the US/Canadian exchange rate? You can easily find out the current exchange rate with the Universal Currency Converter. What is the current or average temperature in Sunset Country? Here's the average temperature in Northwestern Ontario. For current weather in the city or town you are planning to visit, please go to the FAQs page under each town's home page or go to the Weather Network's website. Fishing licenses are available at many of the lodges and resorts in the area. Many tackle and bait shops and gas stations also sell fishing licenses. Not all lodging sells fishing licenses so please check with the resort you have reservations with ahead of time. It is really easy now to get a fishing license online. You can also buy your fishing license at the ServiceOntario office in the community you plan to visit. Click here for a list of all the ServiceOntario offices in Ontario. Fishing licenses are divided into two categories: Residents and Non-Residents. Residents are considered residents of Canada and are required to have a valid Outdoors Card. Residents can purchase either a Sport Fishing License or a Conservation Fishing License. A Conservation Fishing License is for those that like to catch & release or perhaps have a few fish for a shore lunch or to bring home. The limit of fish is generally lower than that of a Sport Fishing License. You can purchase licenses that last three years, one year, or one day. If you are a resident under 18 or older than 65, you don't require a fishing license. Non Residents are considered to be anyone from outside of Canada. Non-Residents can purchase either a Sport Fishing License or a Conservation Fishing License for terms of either one year or seven-days. Non-residents who are under 18 years of age may fish without a license if accompanied by an adult who has a recreational fishing license. Any fish caught are part of the catch & possession limit of the adult who holds the license. Non-residents under 18 may purchase a license and any fish caught apply to the catch & possession limits of that license. To find out the current rates for your fishing license, please check with the Ontario Ministry of Natural Resources. There are separate Non-resident Fishing Licence Options and Residents of Canada Fishing Licence Options. Who needs an Ontario Outdoors Card? What species of fish can I go fishing for? You can fish for a multitude of fish species. The main fish species in Northwest Ontario are: walleye, northern pike, muskie, smallmouth and largemouth bass, lake trout, brook trout, crappie, perch and whitefish. What animals can I hunt? You can hunt for a variety of animals including black bear, moose, whitetail deer, ducks and waterfowl, grouse and wolves. What is an outpost cabin? Outpost cabins are generally single housekeeping cabins located on remote fly-in or boat-in only access lakes. Just imagine being the only cabin on a secluded lake in the Canadian Wilderness. What is a housekeeping cottage? A housekeeping cabin is a cabin for rent that has all the facilities you need for your fishing trip. The cottages are equipped with kitchens so you can fix your own meals and keep your own schedule. Generally, all you need to bring is the food and towels. Please check with your outfitter so you know exactly what to bring. What is an American Plan Package? An American Plan Package is more of an all-inclusive resort or lodge. They generally will serve you a full breakfast and delicious dinner as well as either a shore lunch package or box lunch. Many plans included boat rentals and guide service as well. What is a Modified American Plan or European Plan Package? Modified or European Plans generally include an evening meal. If you're tired of cooking, some of the lodges that have both Housekeeping and American Plan Packages will, with advanced notice, permit Housekeeping customers to have a meal or two in the lodge. What's the difference between "Drive-in", "Fly-in" and "Boat-in"? Drive-in means that there is road access to the accommodation. Fly-in means that you need to fly into the resort or outpost. There are no roads leading to the accommodation. Boat-in means that the resort or outpost is on an island or a remote location that has no road access but can be accessed by boat. How can I get more information on certain lodges or accommodations? To get more information about lodging in Sunset Country, fill out our inquiry form to order your FREE Travel Guide & Map. The pullout area map shows where all of the operators in the area are located. The Travel Guide also has a complete directory of what each accommodation offers as well as their contact information. If you would like more information such as prices or brochures from our members, when filling out the inquiry form, check the box that requests a follow-up from our members. You will then also receive brochures or emails from the tourist operators. Be specific in what you are looking for in the form - i.e. Canoe Outfitting or American Plan or Fly in, that way you should receive responses from the operators that offer what you are looking for. I know what lake I want to fish, how do I find out what outfitters are on that lake? Go to our lakes page, where you will find a list of great fishing lakes. Click on the lake you want to fish and you'll find out which tourist operators are on that lake.